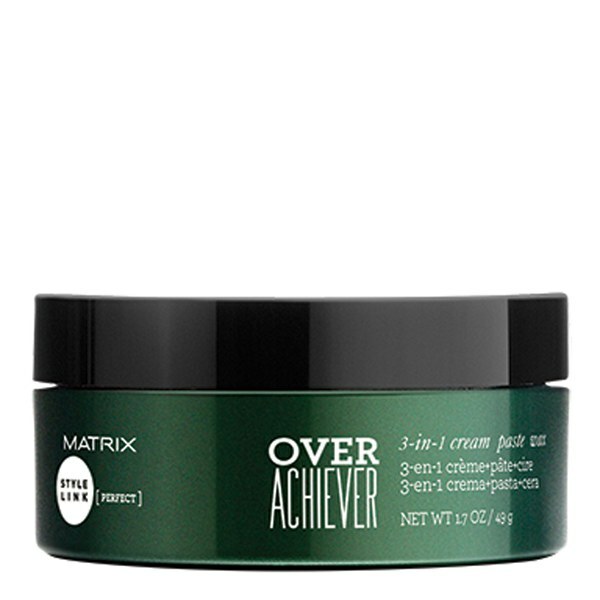 Show your hair who's boss with the Matrix Style Link Over Achiever 3-In-1 Cream, Paste and Wax, a multi-tasking hair styling emulsion that spreads like a cream, texturizes like a paste and holds like a wax. With long lasting hold, the reworkable emulsion allows you to create different styles without a sticky residue, and provides the ultimate in texture and grip. - K.N. Work through damp or dry hair for desired look. Aqua / Water, Isopropyl Myristate, Va/Crotonates/Vinyl Neodecanoate Copolymer, Cera Microcristallina / Microcrystalline Wax, Sorbitol, Stearyl Alcohol, Candelilla Cera / Candelilla Wax, Isoceteth-20, Propylene Glycol, Stearic Acid, Octylacrylamide/Acrylates/Butylaminoethyl Methacrylate, Copolymer, Palmitic Acid, Triethanolamine, Oleth-30, Bis-Diglyceryl Polyacyladipate-2, Butylene Glycol, Alcohol Denat., Parfum / Fragrance, Aminomethyl Propanol, Phenoxyethanol, Caprylyl Glycol, Carbomer, Myristic Acid, Limonene, Benzyl Alcohol, Benzyl Salicylate, Linalool, Citronellol, Coumarin, Geraniol, Crotonic Acid/Vinyl C8-12 Isoalkyl, Esters/Va/Bis-Vinyldimethicone Crosspolymer, Hydroxycitronellal, Ci 19140 / Yellow 5, Citral, Isoeugenol, Eugenol, Ci 14700 / Red 4. The product smells and looks like a blend of citrus and rose, which for me is too feminine. It does feel like a blend of the 3-in-1 as described. It has a good hold, but isn't pliable through the hair. My hair is quite wavey and it doesn't help to straighten it out at all, but at the same time it has a slick "wet" look. I bought the product because it was on offer to try something new. It's not so bad I won't use it, but I definitely won't be buying again. Definitely a mix between a paste and a wax - tends to go in quite stiff and then soften up a bit. Good fragrance and washes out easily. Good product.